A common rose disease is known as black spot (Diplocarpon rosae). The name is very appropriate, as this fungal disease forms black spots all over the foliage of rose bushes. If left unchecked, it can cause a rose bush to totally defoliate. Let’s look at what causes black spots on rose bush leaves and steps for treating black spot roses. Many frustrated gardeners wonder, “What causes black spots on rose bush leaves?” Black spot and roses usually go hand in hand. In fact, many roses get a little black spot, which can even be tolerated to some degree without any harm to plants. However, heavy infections can seriously defoliate plants. Rose black spot is caused by fungus. Dark-brown to black leaf spots develop on the upper leaves, which eventually become yellow and drop. Black spot can be distinguished from other leaf spot diseases by its fringed edges and dark black color. Raised, reddish-purple spots may also appear on rose canes. Warm, humid conditions favor its germination and growth. Once your rose bush gets attacked by the black spot fungus, its markings are there to stay until the marked leaves fall off and a new leaf is generated. The fungus that causes the black spots can be killed and not do any further damage to the foliage but the marks will remain for some time. In my rose beds, a rose named Angel Face (floribunda) was a black spot magnet! If I did not spray her when her leaves first started to form in early spring, she would most certainly get the black spot. In the early spring when the leaf buds on the rose bushes first start to push out the little leaves, I spray all the rose bushes with a black spot treatment fungicide called Banner Maxx or a product called Honor Guard (a generic form of Banner Maxx). After three weeks and then at three week intervals, all rose bushes are sprayed with a product called Green Cure until the last spraying of the season. The last spraying of the season is done with Banner Maxx or Honor Guard again. 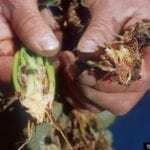 Should the dreaded roses black spot get ahead of you in the rose beds, a product called Mancozeb fungicide will stop black spot on rose bushes in its tracks. I found out about this great product a few years ago when rose black spot got ahead of me and the rose Angel Face was well under attack. The Mancozeb does leave a yellowish powder on all of the foliage, but that is part of how it works. This product is applied every 7 to 10 days for three sprayings. After the third spraying, the normal spraying program may continue. The black spot fungus should be dead, but remember the black spots on the rose leaves will not disappear. The Mancozeb product may be mixed with another fungicide called Immunox and then applied to the rose bushes to lessen the amount of yellowish powder left on the foliage. Both are added to the spray tank as if they were the only product in the tank mix. I have personally used both of these application methods and both worked very well. Treating black spot roses begins with prevention. 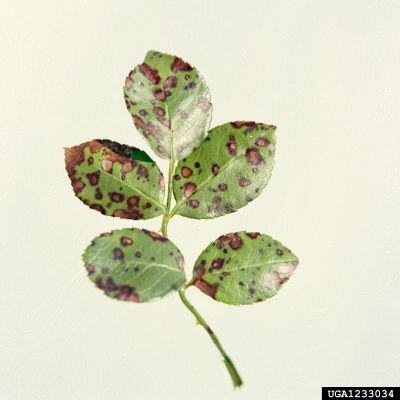 Black spot rose disease control includes adequate planting sites, the use of resistant cultivars, and pruning. Roses should be planted in areas with plenty of sunlight and good circulation. Good garden hygiene is important for treating black spot roses. During the growing season, overhead watering should be avoided. Removal of leaf litter and pruning of diseased canes (back to healthy wood) is also important. Keeping the rose bushes thinned well at pruning and deadheading times will help the airflow through the bush, thus also helping to prevent black spot on roses and other fungal disease outbreaks. With any of the fungal diseases, an ounce of prevention truly is worth a pound or more of cure! Either having a routine spraying program or keeping a close eye on your rose bushes is a priority. The sooner roses black spot treatment starts, the easier it is to gain control of it. I like to use the Green Cure as my main fungicidal spraying product, as it is earth friendly and does the job it needs to do. Neem oil can also be used, which helps control many rose pests as well. Some people also use baking soda, which helps change the pH level on leaf surfaces, making it more difficult for black spot to infect plants. To make this organic solution, mix a couple tablespoons of baking soda with a gallon of water. Adding a drop or two of bleach free dish soap will help keep the baking soda on the leaf. Spray both sides of the foliage. Reapply weekly and repeat after any rain. General Vegetable Garden CareBest Time To Water Plants – When Should I Water My Vegetable Garden?